If you were to cut a section out of the top of a pipe and use a canoe paddle to move the water, you would have a pump. It would not be very efficient, but you would be inputting energy into the water. If you reshaped the paddle into an impeller, you would be able to place more energy into the water. 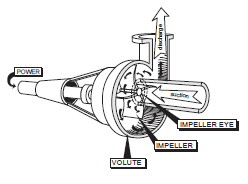 The energy would be transferred from the impeller to the water due to the friction between the impeller and the water. However, water would splash out onto the floor. This is because centrifugal force causes the water to fly outward away from the impeller. If you surrounded the impeller with a case, you could control the waterand obtain a more efficient energy transfer. The case that you would use is volute (spiral-shaped). Volute is geometrical shape, like a circle or a square. For example, a snail shell is volute-shaped. The shape of the case helps to determine the direction of rotation of the pump. The direction of rotation can be determined when looking into the suction side of the volute case.For example,in the case below,the direction of rotation is counter clockwise. Energy transfer - The transfer of energy from the shaft to the impeller and from the impeller to the water. Centrifugal force - The force used to throw the water from the impeller. Close-coupled – A close-coupled pump has only one shaft and one set of bearings: the motor shaft and bearings. The pump impeller is placed directly onto the motor shaft. 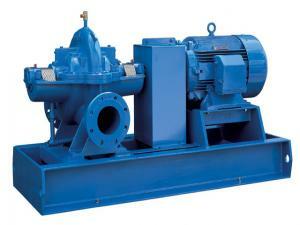 Close-coupled pumps require less space and are less expensive than frame-mounted pumps. 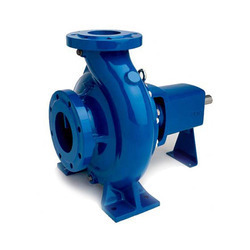 Frame-mounted – A frame-mounted pump has a shaft and bearings separate from the motor. A coupling is required to get the energy from the motor to the pump. For safety purposes, couplings should have guards installed. Split case pumps are unique. The case has a row of bolts that allow half of the case to be removed, providing access to the entire rotating assembly for inspection or removal. These pumps are normally found as fire service pumps and circulation pumps in medium-to-large communities. The circulation pumps in Nome and Fairbanks are split case pumps. 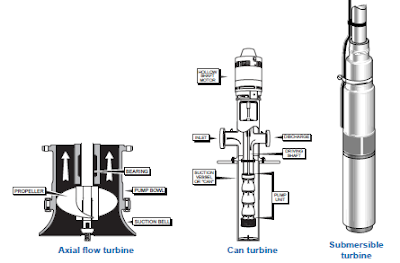 There are four styles of vertical turbines: line shaft, axial flow, can turbine and the submersible turbine. The vertical turbine and the submersible turbine are found in rural communities in Alaska. 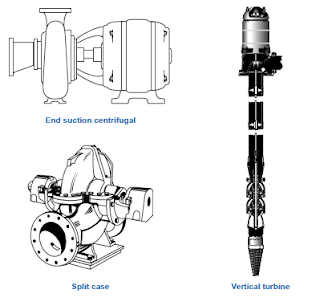 The primary difference between the vertical turbine and the submersible turbine is the position of the motor. The pumping assembly is the same. Submersible turbine pumps in Alaska can range from 5 gpm to 100 gpm or more. 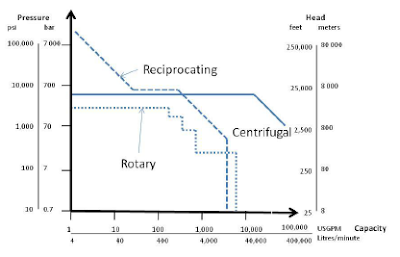 In this article we discussed briefly about the centrifugal pumps and its theory.More about the centrifugal pumps will be discussed in upcoming articles.